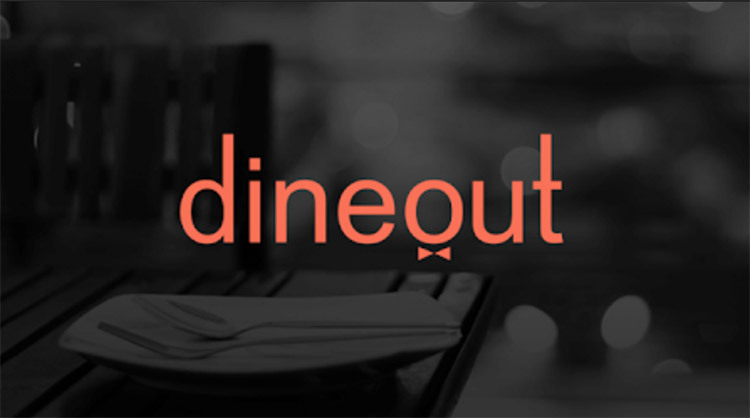 Dineout is a restaurant table reservation service company founded in 2012 by 3 guys based in New Delhi, India. Since its acquisition by Times Internet Ltd in 2014 (then TimesCity), Dineout claims to have grown over 200%. The first time i’ve ever got to know about Dineout App was when ICICI Bank ran Rs.1000 Dineout Voucher Offer on their Amex co-branded credit cards. 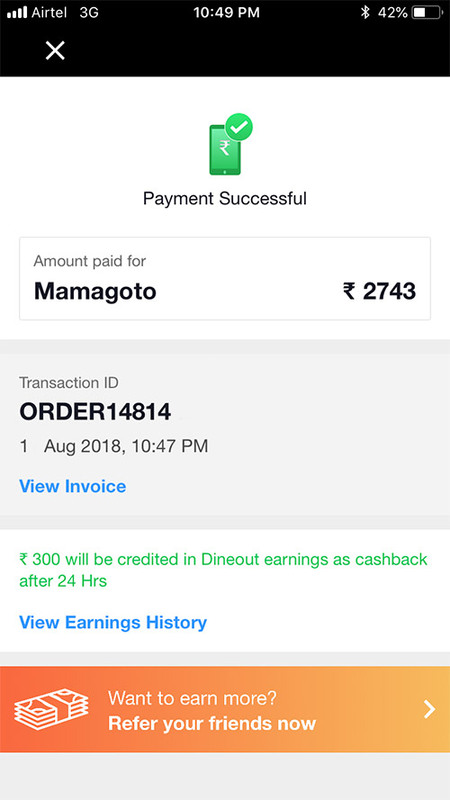 At the beginning, i used to giveaway the vouchers to my friends but then one day decided to really explore it and that’s when i came to know the real potential of the Dineout App. According to me, their USP is their Dineout Pay option, which they used to call as Smartpay earlier. Its more like a wallet and pay to restaurants as such, like real cash. Some restaurants need reservations, while some don’t. One downside is that not all restaurants are Dineout Pay enabled, though you could find good # of restaurants in a given area with Dineout Pay enabled. Ever since i came to know about the app, i accumulated about Rs.4000 worth of Dineout pay through the ICICI offer and used it in many places in Chennai like Punjab Grill, Coal barbecues. 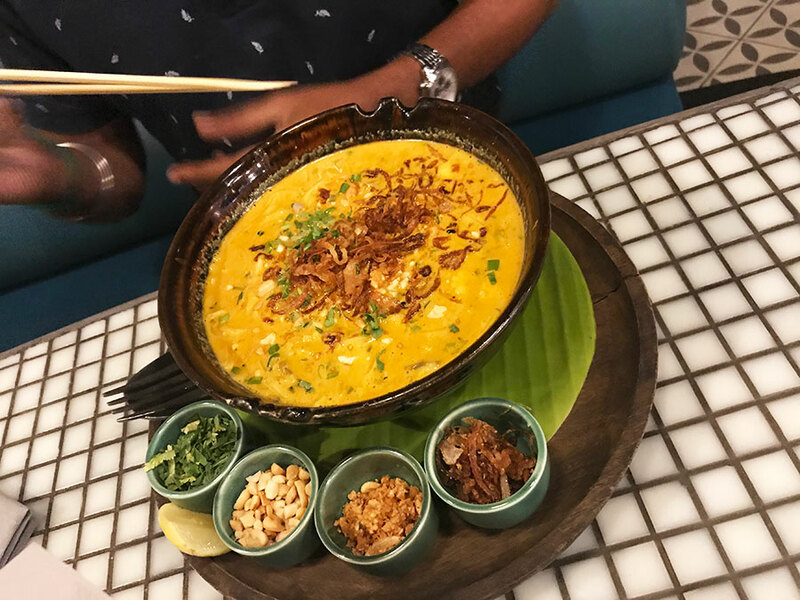 Here’s one of my experience at the restaurant named Mamagoto, Chennai – a Pan Asian restaurant. I reserved the table for two 1 hr before and informed the restaurant before we began with the meal. The app said we get a mocktail free on the reservation, but what it didn’t tell was that its applicable only on weekdays, so we missed that. Well, we ordered a lot of new dishes which i never know that exists in Chennai. Here’s a quick look into the meal & the bill. So we splurged about Rs.2700 for two people. I had about Rs.2000 in wallet by that time, so i used credit card for the remaining amount. Its by far the highest ever i had paid in my life for a dinner, for two – that too for a not so great food. Even in Singapore, we managed to pay under 2k for two. But the good part is, you get cashback to wallet even on this payment, as you could see on the image above (Rs.300). You cant use these cashbacks to pay for more than 25% of the bill in future. You can still use 100% of the voucher amount received from ICICI Offer. While above wallet thing is so cool, you also get offers like: 25%-50% offer on the bill; 1+1 on drinks/food from time to time, just like any other dining app. They also have the premium plans like Gourmet Passport & Dineout Plus – which am not sure how great they’re as i’ve personally not used it. Maybe Standard Chartered – Ultimate card holders could comment on that. As long as you’ve wallet credit, Dineout app is the best dining app around. If not, you may need to explore Zomato or Eazydiner Prime, which i’ll review shortly. After the revolution in the hotel booking sector, dining is going to be the next big thing. You could already see how aggressive Eazydiner is getting lately. I wish all credit card companies has to drop their not so popular individual dining programs & get into this platform and issue more Dineout type vouchers. I’m waiting for the day when ICICI runs the offer again. Do you? Have you used Dineout or any other Dining app before? Do share with us your tips on how you save on dining. Gourmet app started of in Delhi Ncr and has spread to Mumbai, Bangaluru and Hyderabad. It offers either 1+1 on buffet or on main course. The buffet option is definitely worth it if you do go out weekly. I’ve saved 27,000/- through this app over 2 years. It costs 1100 for a year’s membership of Delhi and gives you 3 coupon at all partner restaurants. My rating 4.5/5. Just wish all restaurants offered buffet option as well. 27k – That’s amazing. Thanks for sharing your views. They run great offers but then you have to be careful that the cash back that you receive gets expired almost after a month so you have to be extremely careful about this cash back amount. I have been using this app/DineoutPlus which I got along with my SCB Ultimate card. Very Helpful I would say and the CX team is also quite helpful in case booking is denied. All in all a win win situation. I could see mine with 3 months validity on such “cashback against bill payments”. Good enough isn’t it? I have been uaing this app for a long time and save many rupees. Even if a restaurant doesnt have a deal or booking option you can upload bill and get cool dineout cash. One other point while paying bill through dineout app add money in dineout wallet before payment and u will get 5-10% extra amount added in wallet depending on that day offer – thats a further saving. Yes, 10% extra on adding money is a cool deal too. The issue with Dineout in Pune is that many restaurants accept only 25% of the bill amount as SmartPay. I too had availed this offer and have 2k sitting in the SmartPay…hope I can avail to the fullest! Its 25% with all restaurants now i guess – when you use those promo cashback amount. Yet, you can still use 100% when you use the voucher amount received from ICICI. And with Hdfc DCbB u get 33% back. And adding a promiti code will get u 20% mor discount. I will cost u nett Rs900. DCB gives 33% at burger king? I Got Zomato Gold in 800/- (+ DB points) for 1 year membership . I would like to tell members a trick. Zomato offers Gold in big cities at a premium, while same Gold membership is available at a cheaper price in tier 2 cities like Jaipur, Indore. I live in Gurgaon, last month is visited Indore and opened Zomato, Gold was showing at 50% less price. You can try subscribing Zomato Gold by changing your City. Additionally you can use referral code to get 20% discount. I use Dineout Pay over and above Zomato gold. Thanks to ICICI Amex Vouchers. Zomato Gold has been devalued recently with only 1 unlock allowed for every 2 diners on the table effectively giving a 25% discount(and not 50%). Still remains a good membership though! AmEx offers free EazyDiner Prime membership for one year. They’re running a 50% off food festival this month, and it’s quite nice. I am using it for a while .When you book restaurants through the app you can JP miles also . I got 50 JP miles on Dineout. I had used the dineout app at Delhi, Mumbai, and Ahmedabad. The experience was good, except in one restaurant in Delhi Lajpat Nagar metro station building, where we were denied entry saying the restaurant is full. We managed to get entry the nearest restaurant in the same building and used dineout earnings. For all reservations, I’m getting 40 JP miles. I had faced some issues with the voucher provided. For the month of February 2018, I was given the same voucher code and PIN of the December 2017 voucher. Then the voucher for January 2018 was missed. Although I raised a complaint with ICICI wealth management, the issue is still pending. We had a similar price war going on between MMT and Goibibo a few years and it was great for the travel enthusiasts. Now we see something similar here with Dineout/ Eazydiner/ nearbuy/ gourmet passport/ Zomato gold all targeting the same crowd.